I’ve seen every class twice now at my new school. It’s been hectic, to say the least. I really have to adjust to the idea that I’m part time, and that means the library will get organized and set up on a part time schedule. It is going to take a while, no doubt. But I started checking books out last week, and now I can really start seeing the gaps in the collection that I need to fill in. This coming week is book fair, which is always one of my most stressful weeks of the school year. But once book fair passes I can hunker down and work on organizing and labeling. But, I have been decorating. 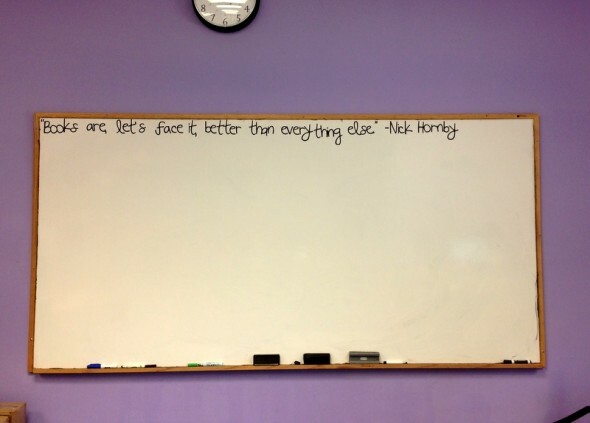 I got some black Cricut vinyl and used my Explore (which is just fabulous) to make this quote for my white board. I kind of stole all of the dust covers off of H’s books (she just tears them anyway), cut them, and laminated them to make this banner. 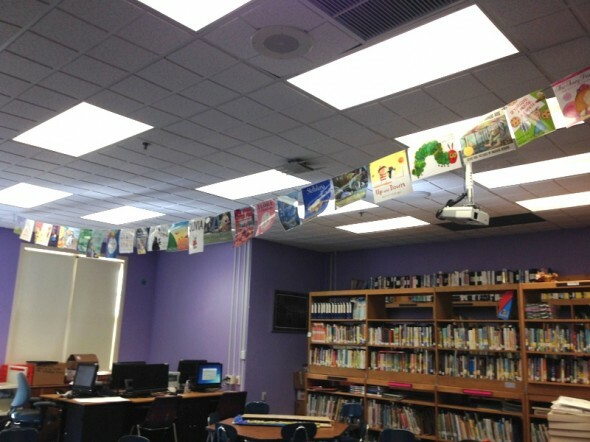 It stretches the width of the library, and it was slightly terrifying to hang. Surprisingly heavy to stretch across a ladder up at the ceiling. But, I love it and so do the kids. 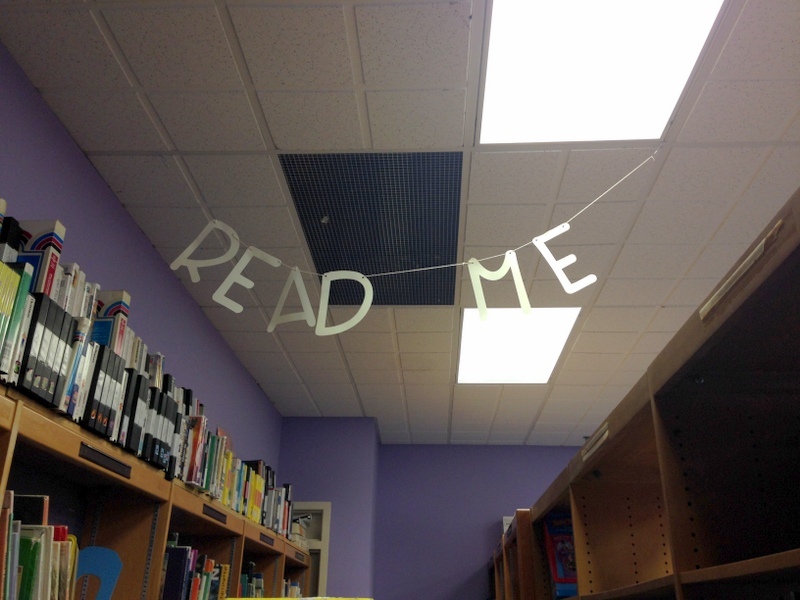 I also made this quick little banner to run across my shelves. This was another Cricut Explore project, just a little something to have up there. I also bought some paper lanterns and strung them up here and elsewhere around the room. And then there’s the door. 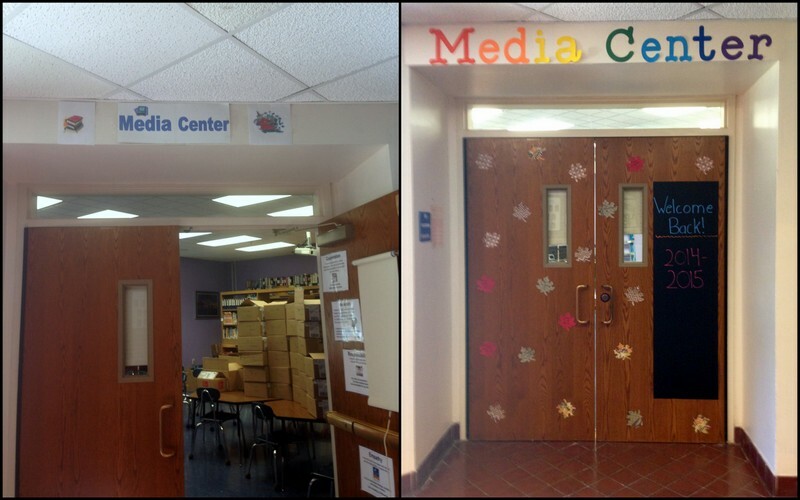 I replaced the Media Center sign with some more Cricut letters (seriously, I’d be lost without that Cricut). I also used it to make some fall leaves. And I bought a chalkboard decal for the door, which will be really handy for announcements. Now to work on the book collection.